Today, Ameripack, Inc., announced the addition of a new accesory to its already extensive line of rotationally molded cases. Made from custom extrusions of lightweight aluminum, and anodized for maximum durability, these caster plates can be added to nearly all of our rotationally molded case sizes and can be retrofit to almost any case that our customers may already have. Precision machined from the highest quality aluminum extrusions, these caster plates are ideal for cases containing heavy parts. 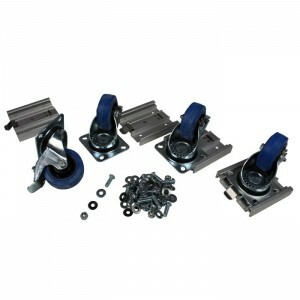 Supplied with high quality Blickle swivel casters that can be locked, you will not find a higher quality removable caster kit anywhere. The casters provide low rolling friction, markless tread, and a weight capacity of more than 250 pounds each.